A new type of air filter has the potential to work faster, cheaper and better than any other, killing virtually all airborne bacteria and viruses in a fraction of a second. It’s a germaphobes dream, and a bullish weapon against the spread of infectious diseases, some of which, like measles, can remain suspended in the air for hours on end. The new device is not only effective at killing viruses, it can actually prevent disease. And if the technology can be miniaturised, the authors say it may one day replace the century-old face mask, allowing us to breathe clean air on the fly. 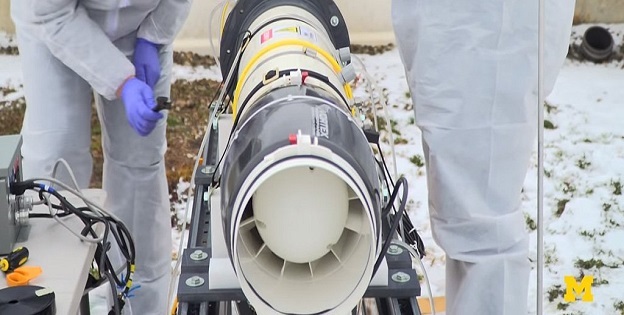 “The results tell us that nonthermal plasma treatment is very effective at inactivating airborne viruses,” says Krista Wigginton, a civil and environmental engineer at the University of Michigan. Nonthermal plasma has been around for over a hundred years, in which time it’s been thoroughly researched. It’s a testament to the technology’s potential that we are still finding uses for it today. The concept sounds like an oxymoron, but nonthermal plasma is essentially like a flame without the heat, created using an electromagnetic reactor. Sending pure oxygen gas through one of these special structures, the new device initiates an effect similar to static electricity. Plasma is merely the ionised, or charged, air particles that form around each spark. The device looks like a simple pipe, but inside, it is filled with glass beads responsible for capturing these tiny little discharges. As electricity flows through the system, electrons are sent flying and atoms are pulled from their molecules, producing a silent glow. The result is a host of free radicals, which are highly reactive particles desperate to reach a stable equilibrium by forming new compounds. The oxygen radical is particularly excited, and when it reacts with a normal molecule of oxygen at room temperature, it rapidly forms ozone, a known antibacterial agent. Within minutes, previous studies have shown that plasma exposure can rupture a bacterial cell’s wall, impairing and destroying its normal activity. The new device has now revealed a similar effect on viruses, successfully ‘zapping and trapping’ 99.9 percent of a test virus into submission – all within a quarter of a second. “In those void spaces, you’re initiating sparks,” says engineer and senior study author Herek Clack from the University of Michigan. The new technique is a two-pronged approach with a whole lot of potential. Not only does the device physically trap the virus within the air stream, more than 99 percent of its success is due to actually inactivating the virus. This parallel approach is way faster and far more efficient than the air filters, surgical masks or ultraviolet light techniques that we use to protect ourselves today. Not even the ozone generated by the active plasma poses a threat, because it is well within regulation standards. While the technology shows great promise for humans and especially hospitals, Clark and his team are starting instead with animals. A pig farm in Ann Arbor is their first candidate, a promising field of research in more than one way, considering livestock viruses are notorious for sparking human outbreaks. “The technology has a long history, but this is just kind of a new use for it,” says Clack. A new frontier that could change the very air that we breathe.